Copyright: © 2018 Rosney DM, et al. This is an open-access article distributed under the terms of the creative commons attribution license, which permits unrestricted use, distribution and reproduction in any medium, provided the original author and source are credited. Background: Previous research has focused on exergaming in clinical patients during rehabilitative sessions. Our objective was to compare balance, cardiovascular health and functional fitness in relation to exercise tests in sedentary adults before and after exergaming (n=12, 56+4 years, 162.1+10.9 cm, 79.2+19.1 kg, 39.6 ± 7.7% fat mass). Methods: Randomly assigned subjects initially underwent balance, cardiovascular endurance and functional fitness tests before engaging in exergaming, 20 min/3d/wk. After 8 weeks, balance, cardiovascular health and functional fitness were retested. Findings: Exergaming improved Single-Leg-Stand time (3.2+0.4s to 7.9+1.4s, p<0.05), Sit-To-Stand repetitions (14.2+1.7 to 16.8+1.3, p<0.05) and YMCA 3-Minute Step Test heart rate recovery (103+7.9 to 95+3.2, p<0.05) while eliciting a habitual voluntary moderate-intensity exercise level in previously sedentary individuals. Conclusions: Exergaming increased cardiovascular endurance, balance and lower extremity functional fitness while meeting American College of Sports Medicine guidelines for moderate-intensity exercise. Exergaming should be considered a viable option for recreational exercise to meet ACSM physical activity recommendations and improve overall quality of life. Regular participation in physical activity is one of the most effective ways to prevent obesity, cardiovascular disease and other morbidities  as well as improve quality of life, increase functional independence and inhibit chronic depression in adults with and without disabilities . In order to implement this behavior change, alternative, innovative, and enjoyable approaches may be necessary to entice sedentary individuals to habitually exercise. Virtual reality video game systems controlled through arm gestures and body motions are becoming increasingly popular and widely promoted. One such commercially available and relatively inexpensive platform is the Nintendo Wii™ originally released in 2006 (Nintendo, Redmond, Washington). The Wii introduced a novel style of active gameplay by using wireless controllers that interact with players through a motiondetection system. The Wii incorporates 3-dimensional accelerometer technology that can respond to changes in direction, speed and acceleration. This allows players to move freely while controlling on-screen characters as they engage in countless activities. The Wii also offers a force plate-controlled balance board with four strain gauge load sensors, one mounted in each corner of the board, to estimate the center of gravity and to track movements with weight shifting. Instantaneous feedback is provided to users on a television screen via interactive games so that they are able to adjust their positioning in real time. Theoretically, if the exercise intensity reached while playing the Wii is moderate, such participation has the potential of meeting the physical activity guidelines established by the American College of Sports Medicine . Furthermore, the visual and auditory stimulation from these games may provide augmented feedback which can be an effective addition to exercise . Expensive visual biofeedback/force plate systems have been used in research for many years. With the release of the Nintendo Wii, therapists in all clinical settings can now afford access to this technology. In fact, the term “Wii-habilitation” is used in the literature to describe the benefits of the Wii system in rehabilitation [5,6]. The potential advantages of utilizing the Wii therapeutically was first reported in 2007 . The proposed benefits included improving post-stroke patients’ fine and gross motor co-ordination, balance and strength. The first reported case in a peer-reviewed journal was the use of the Wii over an 11-week period in the rehabilitation of a 13-year old male with cerebral palsy . The authors reported improvement in the patient’s visual perceptual skills, postural control and functional mobility. More recently, there has been interest in the Wii Balance Board™ to assess individuals’ balance [9-12]. By comparing center of pressure (COP) data collected by both the Nintendo Wii and a force plate, Clark et al. found correlation between the two devices’ standard error of measurement and minimum detectable change in COP (correlation 0.77–0.89). It was also shown that the Wii Balance Board had excellent COP path length test–retest reliability. Additionally, the Wii has been used in patients requiring upper limb rehabilitation , for reducing depression , its effect on loneliness and mood , as well as cognitive function to mitigate age-related cognitive decline . A number of studies have investigated the exercise intensity associated with playing the Wii [17-24]. Wii Sports™ is the most common game as it comes with the Wii when purchased. Several sports can be played, including baseball, golf and bowling, all of which result in energy expenditure of just below three METs and thus regarded as light-intensity [21,22,24]. Although studies have consistently shown that Wii Sports Boxing™ results in the highest intensity of all the Wii Sports games, there is uncertainty about whether or not it can be considered a moderate-intensity activity. Some studies found that Boxing required higher or comparable energy expenditure to brisk walking [19,20,25] while Graves et al. White et al. reported it as a light-intensity activity. Differences in methodologies may explain the variations between studies. The study populations varied from children 22 to adults 24 and some studies used electronic devices to estimate energy expenditure 21 while White et al. used indirect calorimetry. Furthermore, since video games can be played at different levels, either by selection or progress, methodological difficulties arise when comparing energy expenditure across game levels, as these levels can lead to the playing experience being inherently different. Games that require whole body movement are likely to be more metabolically demanding than games that only require upper body movement . Wii Fit™ is a game designed to incorporate movement of not only the upper body but the lower body as well through the use of the pressure sensitive Balance Board. Several studies have examined the energy expenditure associated with playing Wii Fit games [17,18]. The combined mean energy expenditure for playing six Wii Fit games among middle-aged and older adults was 3.5 METs . Similarly, the combined mean energy expenditure for playing Wii Fit Hula Hoop™, step aerobics and jogging games among young adults was 3.6 METs . There is relatively little work with interactive video games to overcome barriers to exercise. This technology could be beneficial not only in healthy yet sedentary populations, but especially for those who are unable to leave their homes. Since previous work has focused on exergaming in clinical patients during rehabilitative sessions, our objective is to test the hypothesis that recreational exergaming can improve cardiovascular health, peripheral muscle functional fitness, balance and self-efficacy in sedentary yet otherwise healthy individuals. All experiments were performed in compliance with the relevant laws and institutional guidelines of the University at Buffalo Health Sciences Institutional Review Board. Sedentary but generally healthy men and women based on the same age, gender, and minority composition of the caregiving population in Erie County outside of Buffalo, New York as published by Department of Health were locally recruited via the hanging of flyers in the local community and using social media listserv emails. Participants must have adequate vision and hearing to interact with games, not presently participating in an exercise program or utilizing Nintendo Wii or other exergaming platforms, no history of seizures or epilepsy, not taking specific medications with the capacity to influence cortisol production via several pathways affecting the HPA axis, no known hyper or hypocortisolism, no known contraindications for exercise. Prior to visiting the lab for the first time, potential participants were phone screened to assess their eligibility, and if deemed eligible, were required to provide informed consent prior to participation in the study. Once eligibility was established, the first lab visit screening occurred in Room  Diefendorf Annex University at Buffalo (SUNY) South Campus and required approximately 2 hours to complete. This screening visit consisted of the Informed Consent anthropometric measures (height, weight, body fat % via the Bod Pod, Cosmed USA Inc., IL), dietary analysis (3-day Diet Record) a Physical Activity Readiness Questionnaire (PAR-Q) and the Yale Physical Activity Survey (YPAS). The PAR-Q has been designed to identify the small percentage of adults whom physical activity may be inappropriate or those who should have medical advice concerning the type of activity most suitable for them. The YPAS was used to determine the type, amount, and patterning of physical activity and voluntary exercise in older adults. Functional fitness tests were then conducted and recorded. The Single-Leg-Stand test measures balance and stability by timing how long participants are able to stand unassisted on one leg with their eyes closed. The Sit-to-Stand test measures lower body strength and endurance by counting how many times participants can stand and then sit back down in 30 seconds. The YMCA 3-minute Step Test determines aerobic fitness by measuring heart rate during and after 3 minutes of stepping up onto a platform in cadence with a metronome. Additionally at the screening visit, hair and saliva samples were collected to determine baseline cortisol levels. These data are presented in a follow-up paper. The following eight weeks consisted of 20-minute exercise visits occurring three times per week in the Diefendorf Laboratory. During these visits, participants conducted whole body metabolically demanding exercises by playing selfselected Nintendo Wii Fit™ games (Table 1) under the observation of trained personnel in the carpeted, wellventilated lab of Diefendorf Annex (Figure 1). This room is conveniently located adjacent a water fountain and restroom, and does not contain objects that participants could accidentally strike or fall into while exercising. Furthermore, this room is well lit, minimizing the risk of photosensitive epileptic seizures. Participants wore a heart rate monitor (Polar Electro Inc., Lake Success, NY) during these exercise visits to capture intensity levels while exergaming. Participants also documented any injuries and other events that occurred in their lives, which may adversely affect their performance in this study. The final study visit occurred back in the laboratory within one week of the last exercise visit and consisted of poststudy measurements repeating the pre-study functional fitness tests and questionnaires from the first laboratory visit to allow for comparison (Table 2), along with four additional questionnaires (Barriers Specific Self-Efficacy, Exercise Self- Efficacy, Subjective Exercise Experience Survey, and the Wii Self-Efficacy Questionnaire). Table 1 Nintendo Wii fit exercises. Nintendo Wii Fit exercise options self-selected by study participants. Table 2 Study timeline of exercise. Figure 1: Diefendorf annex exergaming laboratory, SUNY Buffalo. The difference in outcome measures was analyzed using a two-way analysis of variance (ANOVA) with repeated measures using SigmaStat® software version 4.00 for windows (Systat Software, San Jose, CA). If statistical significance existed, a post hoc t-test with Holm-Sidak correction was used to determine the differences. A value of p<0.05 was considered significant. All data are presented as means SEM except demographics, which are presented as means ± standard deviations. For dietary intake analysis, SAS Statistical Suite (SAS Institute) Version 9.4 was utilized and values are expressed as mean and percentages. Subject recruitment began on September 23, 2015 via the hanging of flyers in the local community and using social media listserv emails. In total, 52 individuals initially expressed interest in participating in this study. Approximately half of those attended informational meetings and signed the Informed Consent form. Thirteen of those were fully qualified and subsequently enrolled into the study. Later, one of those individuals voluntarily dropped out following the initial screening visit citing a schedule that was too busy to participate. Consequently, 12 subjects fully completed all 26 study visits. Subjects’ height, weight, and fat mass (Table 3) were typical of the average American middle-aged adult . No subjects reported any significant changes to their health during the course of the study. Although participants were informed to maintain unwavering lifestyle habits during the study, dietary habits tend to fluctuate due to health awareness evoked by the research experiment presenting a possible confounding variable. Therefore, a 3-Day Diet Record was issued to record dietary intake pre/post study for each participant. 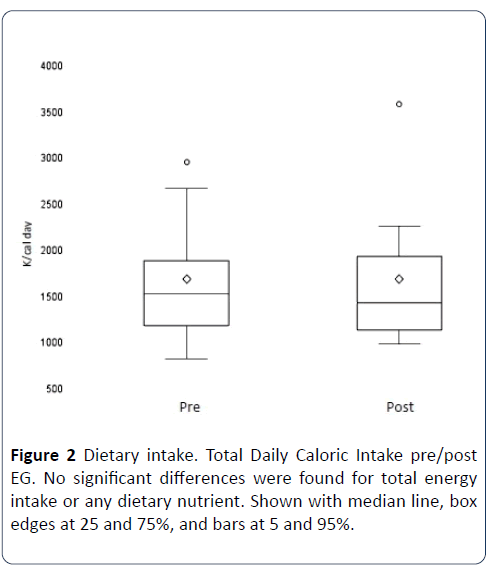 No differences were found before and after the exergaming study in total energy intake or in any dietary nutrient, indicating a strong control for a possible confounding variable during this study (Figure 2). Figure 2: Dietary intake. Total Daily Caloric Intake pre/post EG. No significant differences were found for total energy intake or any dietary nutrient. Shown with median line, box edges at 25 and 75%, and bars at 5 and 95%. Subjects had body weight and composition analyzed utilizing the methodology of air displacement plethysmography of the bod pod device. Measurements were conducted during the initial screening visit and then again on the final visit for pre/post exergaming analysis. Total body mass and Fat Free Mass did not change (Table 3). Table 3 Subject characteristics of participants. All participants wore a heart rate monitor during their 24 exergaming visits to capture exercise intensity levels. The average maximum heart rate achieved over the course of the study was 111 bpm ± 28, which equals 68% of subjects’ agepredicted max heart. These values meet ACSM guidelines for moderate-intensity exercise (Figure 3). Figure 3: Exergaming heart rates. Heart rates during selfselected exergaming expressed as mean ± SEM. All values meet ACSM guidelines for moderate-intensity exercise. The Barriers Specific Self-Efficacy Scale was utilized to rate subjects' perceived capabilities to exercise three times per week for 20 minutes per session over the following 3 months post-study in the face of commonly identified barriers to participation. For each item, participants indicated their confidence to execute the behavior on a 100-point percentage scale comprised of 10-point increments, ranging from 0% (not at all confident) to 100% (highly confident). Total strength for each measure of self-efficacy was then calculated by summing the confidence ratings and dividing by the total number of items in the scale, resulting in a maximum possible efficacy score of 100. Subjects reported a high degree of confidence (96.2 ± 1.9) that they would continue to regularly exercise for up to 3 months after this study despite commonly identified barriers. The Exercise Self-Efficacy Scale assesses an individual’s beliefs in their ability to continue exercising on a three time per week basis at moderate intensities for 20+ minutes per session in the future. For each item, participants indicated their confidence to execute the behavior on a 100-point percentage scale comprised of 10-point increments, ranging from 0% (not at all confident) to 100% (highly confident). Total strength for each measure of self-efficacy was then calculated by summing the confidence ratings and dividing by the total number of items in the scale, resulting in a maximum possible efficacy score of 100. Subjects reported a high degree of confidence (97.7 ± 0.6) that they would continue to regularly exercise for up to 2 months after the conclusion of the current study. The Subjective Exercise Experiences Scale is a 12-item scale assessing three general categories of subjective responses to exercise stimuli: positive well-being (e.g., great), psychological distress (e.g., miserable), and fatigue (e.g., tired). For each item on the SEES, participants rate how strongly they are experiencing each feeling state along a 7-point Likert scale, ranging from 1 (not at all) to 7 (very much so). Our exergaming intervention left subjects feeling “positive” (6.8 ± 0.2), not “drained” (1.8 ± 0.3) or “discouraged” (1.8 ± 0.4). No subjects felt “awful”, “crummy”, or “miserable”. The Wii Exergaming Self-Efficacy Questionnaire assessed participants’ confidence in their ability to continue exercising on a three time per week basis for up to 3 months if they personally owned a Nintendo Wii. Participants also rated how exercising on the Wii made them feel along an 11-point Likert scale, ranging from 0 (strongly disagree) to 10 (strongly agree). Participants reported a high degree of confidence (9.79 ± 0.03) that they would continue to regularly exercise for up to 3 months after the conclusion of the current study if they owned a Wii. Participants also reported that they enjoyed exergaming on the Wii (9.82 ± 0.04) and exergaming on the Wii helped to relieve their stress (9.67 ± 0.05). Subjects answered the Yale Physical Activity Survey to determine the type, amount and patterning of their physical activity and voluntary exercise before and after this study. To score the survey, there are five Index Scores: Vigorous Activity, Leisure Walking, Moving, Standing, and Sitting. Only the Standing Index score of the YPAS significantly changed after exergaming (5.0 ± 1.4 to 7.3 ± 1.1, p<0.05) (Figure 4), a 46% increase. Figure 4: Non-exergaming physical activity. Post-EG resulted in longer periods of standing than pre-EG. Results shown with median line, box edges at 25 and 75% and bars at 5 and 95%, p<0.05. Subjects were timed to measure how long they could stand on one leg without their eyes open to assess balance and stability. 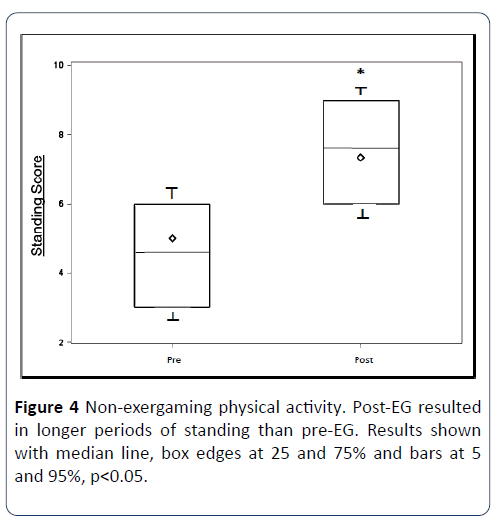 After exergaming, subjects increased their balancing ability by 146%, (3.2s ± 0.4 to 7.9s ± 1.4s, p<0.05) (Figure 5). Figure 5: Single leg stand time. SLS Time (s) pre and post-EG. Post-EG resulted in longer balance times than pre-EG. Results represented as mean ± SEM, p<0.05. Repetitions of sitting to standing were counted to assess lower extremity functional fitness. Post-exergaming values were significantly higher than pre-exergaming values (14.2 ± 1.7 to 16.8 ± 1.3, p<0.05) (Figure 6), an 18% increase. All participants wore a heart rate monitor during and for up to 5 minutes after the YMCA 3-minute Step Test to measure their level of cardiorespiratory fitness. Heart rates were lower during and after the test following exergaming, but only significantly lower during the second minute of recovery (103 bpm ± 7.9 to 95 bpm ± 3.2, p<0.05) (Figure 7), a 7.8% reduction. This study was designed to assess the effects of an exergaming intervention on physical fitness and exercise selfefficacy in healthy middle-aged adults. The findings from this study show a significant improvement in participants’ balance, cardiovascular health, and peripheral muscle functionality. Participants also reported standing longer throughout their day, and high degrees of confidence in their ability to remain active beyond the termination of this study, a noteworthy improvement given that this population was specifically chosen due to their sedentary lifestyles. No differences were found before and after exergaming in total energy intake, in any macro or micro nutrient intake, or in body composition. There are currently a growing number of studies examining the benefits of exergaming on weight loss. Studies have demonstrated considerably higher heart rate, oxygen uptake, and energy expenditure in exergaming participants compared to those playing more sedentary games  or compared to what was observed in the current study. Graves and colleagues reported that energy expenditure was significantly greater when playing active video games (bowling 190.6, tennis 202.5, boxing 198.1 kJ/kg/min) than when playing sedentary games (125.5 kJ/kg/min) or when at rest (81.3 kJ/kg/min) . Additionally, a 20-week randomized study by Staiano et al. evaluating 54 overweight and obese (average BMI at the 94.7 percentile) individuals reported significant weight loss in participants using co-operative exergaming (–1.65 kg) versus competitive exergaming (– 0.04 kg) and control group (+ 0.86 kg) . Our study lacked a cooperative element which may have played a role in the lack of significant compositional changes. Similar results were found in a systematic review by Peng et al. . Participants in the current study expended an average of 3,630 total calories over the eight-week duration. Since the reduction of one pound requires a negative energy balance of 3,500 calories, it is not surprising that no compositional changes were observed. Moreover, five of our twelve participants chose to primarily engage in yoga and balancing activities during their exercise visits, which may further explain our findings. However, while body composition did not change, the lack of any change in dietary intake is a strong indicator that participants complied with study instructions to maintain current eating habits and thus diet was not a confounding variable. High compliance was also seen in study visit participation. No subjects missed any of their visits. This may have been the result from our convenient location on the University at Buffalo. All subjects were affiliated to the University in some manner, faculty or staff. Thus, individuals could easily participate in the study while on campus prior to or after their occupational obligations, or during their lunch breaks. While compositional changes were not observed, average maximum heart rates measured over the course of the study did meet ACSM guidelines for moderate-intensity physical activity. Wii Sports™ is the most common game as it comes with the Wii when purchased. Several sports can be played, including baseball, golf and bowling, all of which result in energy expenditure of just below three METs and thus regarded as light-intensity. Although studies have consistently shown that Wii Sports Boxing™ results in the highest intensity of all the Wii Sports games, there is uncertainty about whether or not it can be considered a moderate-intensity activity. Some studies found that Boxing required higher or comparable energy expenditure to brisk walking  while White et al. reported it as a light-intensity activity. Differences in methodologies may explain the variations between studies. The study populations varied from children 22 to adults 24, and some studies used electronic devices to estimate energy expenditure while Graves et al. used indirect calorimetry . Furthermore, since video games can be played at different levels, either by selection or progress, methodological difficulties arise when comparing energy expenditure across game levels, as these levels can lead to the playing experience being inherently different. Games that require whole body movement are likely to be more metabolically demanding than games that only require upper body movement. We chose to utilize the Wii Fit in the current study because it is designed to incorporate movement of not only the upper body but the lower body as well through the use of the pressure sensitive Balance Board. Several studies have examined the energy expenditure associated with playing Wii Fit games [17,18]. Guderian et al. determined that the combined mean energy expenditure for playing six Wii Fit games among middle-aged and older adults was 3.5 METs . Similarly, Graves et al. reported the combined mean energy expenditure for specifically playing the Wii Fit games of Hula Hoop™, step aerobics and jogging games was 3.6 METs . These findings agree with our own, as the study participants who chose these specific games in the course of the current study achieved the highest recorded heart rates. Our results show that exergaming can produce voluntary exercise intensity levels which meet ACSM recommendations. There is relatively little work with interactive video games to overcome barriers to exercise and improve self-efficacy. We showed that exergaming resulted in higher standing scores on the YALE Physical Activity Survey. However, based on the inherent qualities of questionnaires themselves, the possibility exists that study participants’ answers regarding health and fitness are merely the result of subjective perceptions based solely on participating in a study investigating health and fitness. MacNeill et al. found that even during the initial stages of study participation, subject awareness of their own unhealthy behaviors was raised, revealing evidence of subtle research participation effects which varied according to the health behavior and its perceived social acceptability . French and Sutton concluded that the processes involved in taking part in research studies impacts participants’ thinking and feelings about the targeted behaviors . In the current study, participants were asked to keep their daily schedules routine and compliance was evaluated at every visit, i.e., 24 times over the course of 8 weeks. While no subject indicated an alteration in their daily routine, there remains the possibility of a research participation effect influencing perceptions and thus ultimately results. This experiment also found that previously sedentary individuals reported high degrees of confidence in their ability to remain physically active after exergaming. Subjects also reported that exergaming on the Wii brought them enjoyment and helped to relieve their stress. These findings are notable given that this population had been sedentary prior to exergaming, and that regular participation in physical activity is one of the most effective ways to prevent obesity, cardiovascular disease and other morbidities, as well as improve quality of life, increase functional independence and inhibit chronic depression . The use of BARSE, ESES, SEES, and WESE questionnaires were all novel for a study investigating exergaming. Similarly, in order to implement lifestyle changes in certain segments of the population, novel approaches such as exergaming may be necessary. Analogous to motivational interviewing, exergaming is goal-oriented, client-centered, and non-judgmental in terms of its ability to evoke motivation and engage players to take more positive, healthy, life-affirming actions. Complementing this, our study design allowed subjects to select their preferred choice of exergames on each visit. Logically, such a paradigm allowing for self-determination increases the likelihood that subjects will exercise recreationally and remain compliant, maximizing study benefits. Beyond the psychological nature of study participation, subjects could have truly stood longer rather than merely perceiving they stood longer based on the Hawthorne effect. The Hawthorne effect is a type of reactivity in which individuals modify an aspect of their behavior in response to their awareness of being observed . The original research from 1924-32 at the Hawthorne Works (a Western Electric factory outside Chicago) was commissioned to see if their workers would become more productive in higher or lower levels of light. The workers' productivity seemed to improve when changes were made and diminished when the study ended. It was suggested that the productivity gain occurred as a result of the motivational effect on the workers of the interest being shown in them. Later interpretations such as that done by Landsberger suggested that the novelty of being research subjects and the increased attention from such could lead to temporary increases in workers' productivity . This interpretation was dubbed "the Hawthorne effect". Systematic reviews provide evidence that answering research questions, as well as engaging in other parts of the research process, can and do have a modifying impact on study participants’ behaviors . Yet in the current study, only one of the five specific activities measured by the YPAS (standing) significantly changed, indicating that subjects did not alter their normal daily behavior merely as a result of study participation. These data suggest that while the Hawthorne effect cannot be totally discounted, post-intervention changes in functional fitness were mediated, in part, by fitness-related changes from exergaming. While subjects’ perceptions and reactivity to participating in a research study are possible explanations to current observations, significant improvements to functional fitness were objectively measured. The current study was innovative as most of the non-rehabilitative research on exergaming with adults has been conducted to examine its acute effects on outcomes such as energy expenditure, heart rate or oxygen consumption . Only a few longitudinal studies have been performed with adults to examine their physical functioning and balance training [37,38] and none have utilized the Single Leg Stand test, the Sit to Stand test, and the YMCA 3-minute step test in conjunction with the Wii Fit. The Wii Fit specifically, or exergaming more broadly, has several advantages compared to conventional exercises. Exergaming can motivate people to practice tasks, and by performing multiple tasks users can train both cognitive and motor skills . Additionally, the focus of attention is not on the movements themselves, but on the outcome of the movements during the course of game play. This is important, as in daily life one is also focused on the utilitarianism of movements rather than consciously aiming to maintain balance and proper posture. We established that individuals will voluntarily engage in exergaming with the frequency and duration sufficient to produce changes in fitness. Population participation levels in physical activity are low, and among those who begin a program of physical activity, maintenance is also low . This suggests that physical activity has not proven to be an intrinsically motivating activity for the majority of the population. By design, exergames are meant to be enjoyable, but their hedonistic value does not rely directly on the enjoyment of exercising itself, rather through other mechanisms such as intrinsic motivation. Here we have shown that exergames have the ability to motivate previously sedentary individuals to exercise, and that this level of exercise resulted in improved balance, cardiovascular endurance, lower extremity functional strength, and the ability to perform transitional movements. Consequently, exergames have the potential to reduce the risk of falls and increase the quality of life of middle-aged adults . Interactive video game systems should be considered a viable option for convenient, enjoyable, in-home recreational exercise to assist individuals in meeting ACSM physical activity guidelines. A novel idea from this research is using interactive video game systems as a mode of exercise for homebound caregivers of dementia patients. Exergaming interventions have previously been utilized in dementia patients. Yet as the number of individuals with dementia increases, so too will the number of caregivers. The need for physical activity interventions in the caregiving population is exhibited by their low levels of exercise, poor mental health, significantly greater stress, anxiety, depression and deleterious physical condition . Furthermore, caregivers have lower exercise self-efficacy, social support to exercise and greater perceived barriers to exercise than non-caregivers. Exergaming may increase the strength and stamina needed to perform the demanding physical tasks of caregiving while reducing caregiver stress, anxiety, depression and fatigue. Moreover, since caregivers with compromised physical and emotional welfare are less likely to provide quality care due to their own ailing health, the institutionalization of elderly care recipients could potentially be delayed when that care is administered by more active, healthier and less despondent providers through exergaming. Exergaming improved balance, cardiovascular endurance, lower extremity functional strength, and the ability to perform transitional movements, thereby potentially reducing the risk for falls and consequently increasing the quality of life in middle-aged adults. Study participants also reported higher levels of exercise self-efficacy and lower barriers to exercise after experiencing the exergaming intervention. Additionally, exergaming elicited an habitual voluntary moderate-intensity exercise level in previously sedentary study participants. Although this analysis showed improvements in participant balance, cardiovascular endurance, lower extremity functional strength, and the ability to perform transitional movements after 8 weeks of exergaming, all results must be interpreted with caution since no control group was entered into this model. Additionally, exergaming improved YMCA 3-minute Step Test heart rates only during the second minute of recovery. This could be due to the limited number of participants (n=12). A larger sample size may have resulted in a stronger outcome; however, this was a proof of concept/pilot study design. The current exergaming study explored the potential benefits of interactive video games as an exercise instrument for middle-aged adults who do not have a gym membership or who otherwise cannot regularly make it to their local fitness center. The Nintendo Wii was chosen because of the plethora of research conducted in the decade since the Wii’s introduction. Exergaming interventions in future studies should include more modern technologies, such as video game systems controlled through arm gestures and body motions via a motion capture camera (e.g., PlayStation Move™). A novel idea for future exercise studies is using interactive video game systems as a mode of exercise for homebound caregivers of dementia patients. Exergaming interventions have previously been utilized in dementia patients. Yet as the number of individuals with dementia increases, so too will the number of caregivers. The need for physical activity interventions in the caregiving population is exhibited by their low levels of exercise, poor mental health, significantly greater stress, anxiety, depression and deleterious physical condition. Furthermore, caregivers have lower exercise self-efficacy, social support to exercise and greater perceived barriers to exercise than non-caregivers. Exergaming may increase the strength and stamina needed to perform the demanding physical tasks of caregiving while reducing caregiver stress, anxiety, depression and fatigue. Moreover, since caregivers with compromised physical and emotional welfare are less likely to provide quality care due to their own ailing health, the institutionalization of elderly care recipients could potentially be delayed when that care is administered by more active, healthier and less despondent providers through exergaming. Garber CE, Blissmer B, Deschenes MR, Franklin BA, Lamonte MJ, et al. (2011) Quantity and quality of exercise for developing and maintaining cardiorespiratory, musculoskeletal, and neuromotor fitness in apparently healthy adults: guidance for prescribing exercise. Med Sci Sports Exerc 43: 1334-1359. GSA (2011) The Gerontological Society of America 64th Annual Scientific Meeting Boston, MA ABSTRACTS. Gerontologist 2: 1-532. O'Donovan C, Hussey J (2012) Active video games as a form of exercise and the effect of gaming experience: a preliminary study in healthy young adults. Physiotherapy 98: 205-210. Stanton R, Ada L, Dean CM, Preston E (2011) Biofeedback improves activities of the lower limb after stroke: a systematic review. Journal of Physiotherapy 57: 145-155. Butler DP, Willett K (2010) Wii-habilitation: Is there a role in trauma? Injury 41: 883-885. Farrell L (2009) The Best Medicine Wii-habilitation. Br Med J, pp: 338-350. Miller J (2007) USA Today. Deutsch JE, Borbely M, Filler J, Huhn K, Guarrera-Bowlby P (2008) Use of a low-cost, commercially available gaming console (Wii) for rehabilitation of an adolescent with cerebral palsy. Phys Therap 88: 1196-1207. Agmon M, Perry CK, Phelan E, Demiris G, Nguyen HQ (2011) A pilot study of Wii fit exergames to improve balance in older adults. J Geriatr Phys Therap 34: 161-167. Clark RA, Bryant AL, Pua Y, McCrory P, Bennell K, et al. (2010) Validity and reliability of the nintendo Wii balance board for assessment of standing balance. Gait Posture 31: 307-310. Esculier JF, Vaudrin J, Beriault P, Gagnon K, Tremblay LE (2012) Home-based balance training programme using wii fit with balance board for Parkinson's disease: a pilot study. J Rehabil Med 44: 144-150. Young W, Ferguson S, Brault S, Craig C (2011) Assessing and training standing balance in older adults: A novel approach using the 'Nintendo Wii' Balance Board. Gait Posture 33: 303-305. Joo LY, Yin ST, Xu D, Thia E, Fen PC, et al. (2010) A feasibility study using interactive commercial off-the-shelf computer gaming in upper limb rehabilitation in patients after stroke. J Rehabil Med 42: 437-441. Slater GY, Dickin D, Dishman M (2010) Meta-analysis of the effects of exercise and use of nintendo wii for reducing depression among older adults. Gerontologist 50: 104-104. Kahlbaugh PE, Sperandio AJ, Carlson A (2010) The effect of playing the wii on loneliness and mood in the elderly. Gerontologist 50: 286-287. Ackerman PL, Kanfer R, Calderwood C (2010) Use it or lose it? WII brain exercise practice and reading for domain knowledge. Psychol Aging 25: 753-766. Graves LEF, Ridgers ND, Williams K, Stratton G, Atkinson G et al. (2010) The physiological cost and enjoyment of wii fit in adolescents, young adults, and older adults. J Phys Act Health 7: 393-401. Guderian B, Borreson LA, Sletten LE, Cable K, Stecker TP, et al. (2010) The cardiovascular and metabolic responses to Wii Fit video game playing in middle-aged and older adults. J Sports Med Phys Fitness 50: 436-442. Willems MET, Bond TS (2009) Comparison of physiological and metabolic responses to playing nintendo wii sports and brisk treadmill walking. J Hum Kinet 22: 43-49. White K, Schofield G, Kilding AE (2011) Energy expended by boys playing active video games. J Sci Med Sport 14: 130-134. Graves LEF, Ridgers ND, Stratton G (2008) The contribution of upper limb and total body movement to adolescents' energy expenditure whilst playing Nintendo Wii. European Eur J Appl Physiol 104: 617-623. Miyachi M, Yamamoto K, Ohkawara K, Tanaka S (2010) METs in adults while playing active video games: a metabolic chamber study. Med Sci Sports Exerc 42: 1149-1153. Maddison R, Mhurchu CN, Jull A, Jiang Y, Prapavessis H, Rodgers A (2007) Energy expended playing video console games: An opportunity to increase children's physical activity? Pediatr Exerc Sci 19: 334-343. Prevention (2017) National Center for Health Statistics. Smallwood SR, Morris MM, Fallows SJ, Buckley JP (2012) Physiologic responses and energy expenditure of Kinect active video game play in schoolchildren. Arch Pediatr Adolesc Med 166: 1005-1009. Staiano AE, Abraham AA, Calvert SL (2013) Adolescent exergame play for weight loss and psychosocial improvement: a controlled physical activity intervention. Obesity 21: 598-601. Peng W, Crouse JC, Lin JH (2013) Using active video games for physical activity promotion: a systematic review of the current state of research. Health Educ Behav 40: 171-192. MacNeill V, Foley M, Quirk A, McCambridge J (2016) Shedding light on research participation effects in behaviour change trials: a qualitative study examining research participant experiences. BMC Public Health 16: 91. French DP, Sutton S. Reactivity of measurement in health psychology: How much of a problem is it? What can be done about it? British Journal of Health Psychology 15: 453-468. 33 Fox NS, Brennan JS, Chasen ST. Clinical estimation of fetal weight and the Hawthorne effect. 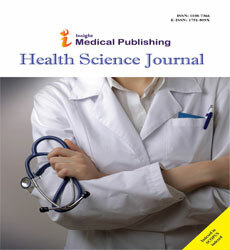 European Journal of Obstetrics & Gynecology and Reproductive Biology 141: 111-114. Landsberger HA (1958) Hawthorne revisited: Management and the worker, its critics, and developments in human relations in industry. Cornell University Press. McCambridge J, Witton J, Elbourne DR (2014) Systematic review of the Hawthorne effect: New concepts are needed to study research participation effects. J Clin Epidemiol 67: 267-277. Garn AC, Baker BL, Beasley EK, Salmon MA (2012) What are the benefits of a commercial exergaming platform for college students? examining physical activity, enjoyment, and future intentions. J Phys Act Health 9: 311-318. Chao YY, Scherer YK, Wu YW, Lucke KT, Montgomery CA (2013) The feasibility of an intervention combining self-efficacy theory and Wii Fit exergames in assisted living residents: A pilot study. Geriatric Nursing 34: 377-382. Anderson-Hanley C (2012) Exergaming and older adult cognition a cluster randomized clinical trial. Am J Prev Med 42: 109-119.
van Diest M, Lamoth CJC, Stegenga J, Verkerke GJ, Postema K (2013) Exergaming for balance training of elderly: state of the art and future developments. J Neuroeng Rehabil 10: 101. Bock BC, Thind H, Dunsiger SI, Serber ER, Ciccolo JT, et al. (2015) Exercise videogames for physical activity and fitness: Design and rationale of the Wii Heart Fitness trial. Contemp Clin Trials 42: 204-212. Marquez DX, Bustamante EE, Kozey-Keadle S, Kraemer J, Carrion L (2012) Physical activity and psychosocial and mental health of older caregivers and non-caregivers. Geriatr Nurs 33: 358-365.